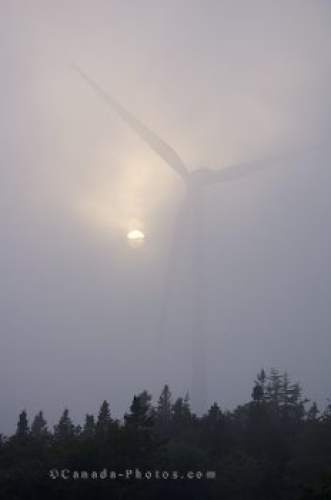 The sun glowing in the foggy evening reveals a windmill in Nova Scotia, Canada. A foggy evening slightly reveals a windmill at the Pubnico Point Wind Farm. The sun is a backdrop to the outline of the windmill. The windmill looks like a shadow in the foggy evening. The sun glows through the clouds revealing the windmill. Windmill appearing from behind a veil of fog with the sun glowing behind at the Pubnico Point Wind Farm on a foggy evening in Lower West Pubnico, Pubnico Point, Acadian Region, Lighthouse Route, Highway 335, Nova Scotia, Canada. A foggy evening at the Pubnico Point Wind Farm reveals a windmill from the glowing sun.